Sourced from the Hoopers vineyard – which is adjoining the Terre à Terre vineyard in Wrattonbully – the two rows of Pinot Gris that produced this fruit were historically grown with dry Pinot Gris production in mind. 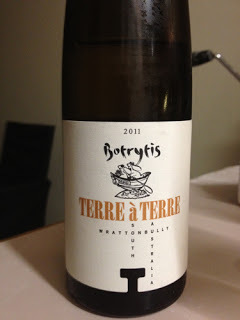 Xavier (Bizot, Terre à Terre winemaker) however saw the potential to make an Alsatian style botrytis Pinot Gris from said fruit (particularly given that it was quite botrytis prone) and thus started taking the grapes last year. Fortunately for Xavier (for this wine at least) the wet and cold 2011 vintage was perfect for botrytis infection, with some 20% of these Pinot Gris grapes heavilyy botrytised, 30% partially botrytised and 50% not infected, a ratio that made for some almost ideal fruit for the intended style (it was still hand harvested/sorted though). Once harvested the grapes were crushed and fermented until the must hit 10.4% potential alcohol, leaving 111g/l RS. It then spent four months in old oak before bottling just a few months ago. What makes all this information interesting is that the final wine produced has a balance of fruit/sugar/acidity that is genuinely admirable. It, successfully I think, treads that fine line between massive richness and cool acid refreshment in a vein that is more of a lighter Mount Horrocks than much of the marmalade heavy, botrytis rich stickies that Australia is most renowned for (not discounting that style of course, but this I think has a freshness that I genuinely prefer). Interestingly enough though this smells rather botrytis indeed, carrying that powerful note of noble rot that is quite unmistakeable. Yet it’s also a fragrant and pretty smelling wine, carrying talc and frangipani and lavender and orange blossoms, flying in the face of the botrytis funk. The glory though is the palate which couples chalky acidity to orange rind, apple pie and white peach fruit, with everything then capped off with chalky acidity and balanced sweetness. The secret (or not so secret really) here I think is all about lightness. It’s hardly an overtly intense wine, instead leaning towards modesty and restraint. Yet it’s also that modesty and restraint that makes you reach for a second and a third glass, a characteristic I can’t help but admire. The only thing this needs now is a little more bottle age to allow for the wine to gain weight and settle into it’s skin.